Amanda Hope Rainbow Angels holds a special place in the heart of Kay McDonald and the team at Charity Charms. We know Amanda’s mother, Lorriane Tallman, and the amazing legacy she has built to honor her daughter Amanda (and most recently her husband Marty). Charity Charms is so honored to support Lorriane’s hard work and the work of her amazing staff by creating custom charms and jewelry from their wonderful new logo. 100% of the net proceeds from the sales of their charms will benefit their mission directly. Approximately 1 in 285 children in the United States will be diagnosed with childhood cancer before age 20. In fact, cancer is the most common cause of disease-related death in children. Cancer is a disease that affects all of us in one way or another, and to see a child struggling with something this difficult is heartbreaking. This is why hope is one of the most important driving forces during hard times like these. It is easy to feel overwhelmed, but that is why Amanda Hope Rainbow Angels is there. 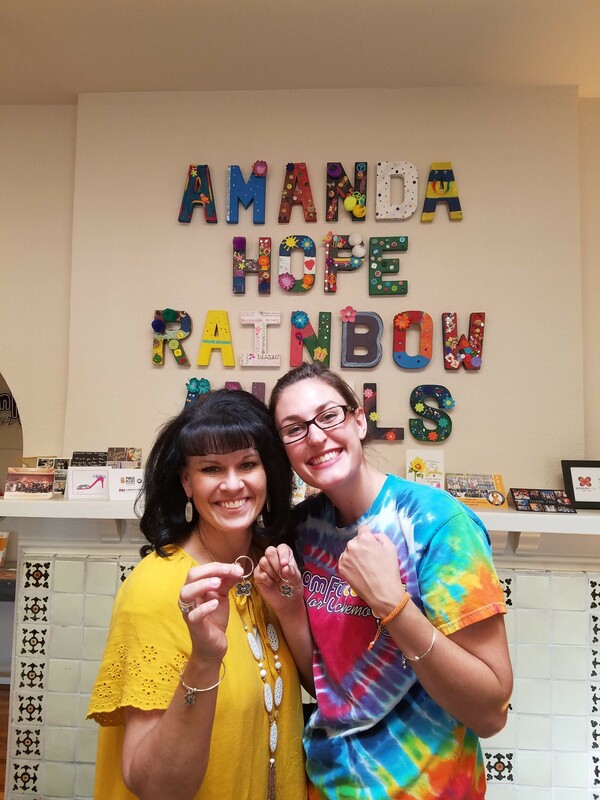 We recently worked with Amanda Hope Rainbow Angels to create childhood cancer awareness bracelets. These bracelets and keychains will go a long way in spreading Amanda’s beautiful message and spirit to others. Amanda Hope Rainbow Angels does important work for children and their families. For this reason, they run an online store with products that increase awareness of their mission, vision, and programs. Charity Charms is proud to be among those chosen to be a vehicle for this important cause. We created signature bangle bracelets and keychains. The newest addition is a selection of Caring Cords. Amanda Hope Rainbow Angels Caring Cord bracelets come in their signature orange, red, and purple to match their branding. These childhood cancer awareness bracelets are unique and special. Caring Cords are handmade macramé cotton bracelets. They are Earth-friendly and adjust to fit any wrist. Additionally, they feature a 100% recycled pewter charm as the defining touch. The Amanda Hope Rainbow Angel bracelets and keychains feature their butterfly charm. A butterfly is a powerful symbol of change, spirit, and most importantly hope. Amanda Hope Rainbow Angels honors Amanda, a young girl who lost her battle with pediatric cancer. Amanda was the type of child who could light up the world with a smile. Through her treatment, her spirit never dwindled. In fact, she was often more concerned about the other children in the hospital. Amanda Hope Rainbow Angels has an impactful vision to bring dignity and comfort to children affected by disease. Not only pediatric cancer but any life-threatening illness. Today, they have brought this vision to life and helped over 7,000 children. Amanda’s legacy lives on through their ComfyCozy’s program. This program, in particular, came from this desire to return dignity to children going through chemo. ComfyCozys are simple shirts designed for children with their comfort in mind. Through their Care Pack program, each child gets a care package featuring a ComfyCozy when they receive their chemo port. Moreover, through the process, they receive a comfort pack and a No More Chemo Party Bag when finishing treatment. Many forms of childhood cancer have increased their success rates, but many have not. Pediatric cancer is becoming a lifelong disease. To put it differently, when cancer is gone there is many other health-related issues it puts on the body. For example, other illnesses, organ damage, infertility, and more. Amanda Hope Rainbow Angels continue to expand and launch new programs. They provide distractions, therapy, and even financial assistance because treatment can be costly. Like we previously mentioned, cancer is a disease that affects all of us in some way. Cancer may not be preventable just yet, but we can do many things to help those stricken with this unfortunate disease. We are thankful to be a part of the Amanda Hope Rainbow Angels family. We are optimistic these childhood cancer awareness bracelets spread hope to many more children and families. To donate or learn more visit their website. Bring awareness to your Organization, School or Business through the Power of Charity Charms. Contact us to learn more.